Brett started out as a trainee at Portsmouth in 1986, and his career took the striker to numerous clubs over the next 18 years. After failing to make the grade at Portsmouth, he looked to be heading out of the game until he was spotted playing in a six-a-side game and given a trial at Cheltenham Town. After just six months with the Robins in which he amassed 24 goals, Derby County offered £40,000 for his services and he arrived at the Baseball ground in February 1988. His first team opportunities were limited however and the Rams agreed a £33,000 fee from Stockport County where he scored 33 goals in 84 games. With an offer of £100,000 his next stop was Southend United where he continued his impressive strike rate and attracted attention from Everton. After an initial loan period at the start of the 93/94 season, the Premiership side took a gamble and signed him for £500,000 in January 1994, but 1 goal in 21 games saw him drop out of the favour. He was transferred to Sunderland in March 1995 for £600,000 where he continued to struggle, being loaned out to Sheffield United and West Bromwich Albion. After a further three month loan period back at Stockport County at the start of the 96/97 season, he was signed for £120,000 and soon found his former goalscoring touch. During his two periods with the Hatters, he scored 94 times in 235 appearances. Towards the end of his time with Stockport, he went on loan to Notts County and Preston North End, before being released again in the summer of 2000. 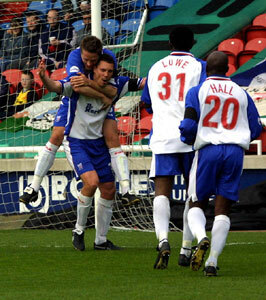 He spent a 1½ seasons at Walsall before Brian Talbot took him to Nene Park on a free transfer in March 2002. Allocated squad number 12, he scored in his debut at Mansfield Town when a came on as a first half substitute, replacing the injured Duane Darby. Having won a play-off winners medal with Walsall the previous year, he was unsuccessful with Diamonds when a came on to replace Scott Partridge in the play-off final defeat against Cheltenham Town. After non contract periods with Port Vale and QPR, he retired from playing and became youth and reserve team coach to Portsmouth in October 2005, but was sacked after just six months. After teaching at Edge Hill University, Brett went to Warrington Town of the Unibond League Division One South where he was appointed first team coach in October 2007. He is now working as a consultant for Progression Sports Management, which offers advice to professional footballers.